**Photo above, bottom shows Margaret Walker and Janette Lancaster, relatives of the women involved in these two cases. NSW Police Homicide Squad is ready and willing to listen to anyone with definite information about Malcolm Naden's current whereabouts. I know that you might feel scared about contacting Police but I am vouching for then, they WILL listen to you and WILL help you. Police yesterday confirmed they were treating as suspicious the death of young mother Kristy Scholes - a close relative of missing Dubbo woman Lateesha Nolan. Ms Scholes, 24, was reported missing about 10pm last Wednesday after not being seen for at least a day. Police found her body in a locked spare bedroom of a home she had been house-sitting - a home which belonged to the grandmother of Lateesha Nolan and was the location she was last seen on January 4. The house was next door to Ms Scholes' own home in Bunglegumbie Road, West Dubbo. Her cause of death could not be established, although police said she was surrounded by a number of items including pillows and blankets, and they had been waiting on the results of an autopsy performed on Friday afternoon. Although unable to release exact details of the autopsy, Orana crime manager Detective Inspector Mick Willing said the death was now being treated as suspicious and Strikeforce Durkin had been set up to investigate. He said the investigation would take into account Ms Scholes' relationship with Ms Nolan - who was the cousin of her defacto partner - but any connection between the disappearance and the death was "purely speculative" at this stage. He said "common sense" would suggest the two should be looked at together. Inspector Willing said a number of people had already been interviewed and more were yet to be interviewed. This included family members who had been in Sydney. He said Ms Scholes' children - a three-year-old boy and four-year-old girl - had been interviewed using specialist police. It is believed they were in the house while their mother was dead in another room and that a number of other people were also at the home during the day looking after them. However, it appeared nobody realised she was behind the locked door. A friend had spoken to Ms Scholes by phone earlier in the week - the last contact she is known to have had - and the same woman reported her missing, police said. Lateesha Nolan, a 24-year-old mother of four, was last seen at the same Bunglegumbie Road house about 9.30pm on January 4. She told her relatives she would be "back in a sec", leaving her wallet and cigarettes at the house. But she never returned and her blue Ford Falcon station wagon was found abandoned the following afternoon at a parking bay beside the Macquarie River. Police are seeking any information on Ms Scholes' movements from Monday June 20 onwards. Anyone with information should contact Dubbo police station on 6881 3222. Police are investigating possible links between the murder of an Aboriginal woman in the NSW central west and the suspicious disappearance of a close relative. The body of Kristy Scholes, 24, a mother of two, was found by police in a locked room at a West Dubbo home last Wednesday, after she was reported missing by a friend that afternoon. Police today refused to reveal the cause of death. Ms Scholes' children, aged three and four, were in another part of the house when police discovered their mother's body. The house is owned by the grandmother of Lateesha Nolan, a 24-year-old mother of four who was last seen entering the same house on January 4 this year. Detective Inspector Mick Willing said police were treating Ms Scholes' death as a murder investigation. "Ms Scholes was looking after the house, with a lot of people coming and going during the day, when she was reported missing," Det Insp Willing said. "No-one thought to check the locked room where we eventually found her." Ms Scholes lived next door to the house as part of an extended family and was the de facto wife of Ms Nolan's cousin. Police also believe Ms Nolan was murdered. "She (Ms Nolan) wouldn't go anywhere without keeping in touch with her children ... the circumstances are such that we can come to no other conclusion," Det Insp Willing said. He said links between the two murders were "speculative" at this stage. Dubbo's Western Plains Zoo was closed to the public today as police searched for suspected double murderer Malcolm Naden. The action came after a report Naden was hiding in the grounds of the world-famous zoo, in central western NSW. The zoo, a former army camp during World War Two, is a 300 hectare oasis of woodland and irrigated grassland, containing more than 1,000 different animals from five continents. Some 60 police and a Polair helicopter searched that expanse for eight hours while one zookeeper remained on site until the zoo was reopened around 1600 AEDT. A police spokeswoman said there had been a report that 31-year-old Naden had been sighted in the zoo. Police issued an arrest warrant for him in August in connection with the death of 24-year-old mother-of-two Kristy Scholes and the disappearance of his cousin, Leteesha Nolan. A former shearer, Naden is believed to be a skilled bushman and may have been hiding out in scrub in order to avoid capture. A number of guests at the on-site hotel at the zoo, Zoofari Lodge, were also evacuated. 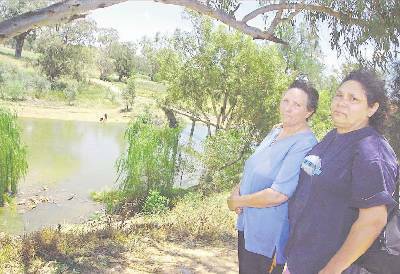 Naden, Scholes and Nolan were part of an extended family living in West Dubbo. The body of Ms Scholes, the common law wife of one of Naden's cousins, was found in a Dubbo home on June 22 after a friend reported her missing. Ms Nolan, a mother of four who lived at the same West Dubbo house, disappeared on January 4 this year. DESPITE fears a suspected murderer is hiding within the grounds, Western Plains Zoo in Dubbo, NSW will reopen to the public today. A large-scale search was conducted in the zoo yesterday in a bid to find Malcolm Naden, 31, a key suspect in the murder of 24-year-old Kristy Scholes. There was no sign of the experienced bushman, who police believe has been living in the park for several months. He has been spotted by zoo security on several occasions - the last time on Thursday morning. The world-famous zoo was closed yesterday for the search and although the fugitive was not found, police said he remained in the surrounding area. Inspector Greg Spinks told The Daily Telegraph yesterday that there was no fear for public safety. "After a long discussion with zoo staff, we decided there was no concern whatsoever for public safety and the park was handed back to staff for them to open tomorrow," he said. Earlier in the day, a police spokesman said: "There's been a sighting and we have reason to suspect he may be hiding out in the zoo. "We believe he may have been sourcing food from the park and may have been living there for several months." Mother-of-two Kristy Scholes was found strangled in a Dubbo home on June 23. Naden is the prime suspect. Police, who issued a warrant for his arrest in August, also want to question Naden in relation to the disappearance of mother-of-four Lateesha Nolan, who was last seen in Dubbo on January 4. The three were part of an extended family living in West Dubbo. Offering information in August in a bid to catch the suspected murderer, police alleged Naden had left his young nephew and niece locked inside a home for up to eight hours after strangling their mother. Confused, four-year-old Elizabeth Scholes then cut through a flyscreen to escape her grandparent's Dubbo home, leaving three-year-old brother John inside while their mother lay dead in a separate room. Relatives found Elizabeth wandering in the front yard on June 22 and called police, but it was not until the following day that Ms Scholes' body was located inside a locked bedroom, where Naden had also been living. A spokeswoman for the Taronga and Western Plains Zoos said yesterday all visitors had been evacuated, including an unknown number of people who had been staying at an on-site lodge. "The zoo was closed at 8am [Friday]," the spokeswoman said. A handful of staff remained on site yesterday to look after the animals. Hundreds of tourists were turned away from the park yesterday, including several who had driven for several hours to spend the day at the park. One woman said she was bitterly disappointed, having driven her daughter to the park from Sydney. there isn't a day that gose bye that i don't think of u. Comments: deepest symphothy to all family and friends of kristy & Lateesha. i feel for ya's, another 2 beautiful who's lives have been taken. To the kids, ever feel down thinkin about it, think of all the good memories they left you's.